Quick Description: Located within the Hakone Open-Air Museum. 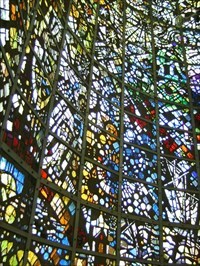 This 18 meter high tower is enclosed by stained glass patterns and images. The tower was produced by Nobutaka Shikanai, with sculptured glass by Gabriel Loire, and reliefs by Atsushi Imoto. Presently there are 868594 waymarks worldwide, listed in 1117 user-created categories.